Contemporary challenges and contexts of the local, regional, national and global raise urgent questions about cultural conviviality and cosmopolitan futures across the world. These are times when trans-cultural, trans-national and multicultural belonging are particularly being tested through environmental catastrophe, economic volatility, parochialism, fundamentalism, notions of cosmopolitan and multicultural exhaustion, and war. A key challenge lies in the paradox of culture, in which belonging has become a fundamental question of preservation, atavism, tradition and survival as well as hybridity, transgression, possibility and transformation. The aim of this conference theme is to respond to this paradoxical challenge by opening up discussion, critical reflection and analysis about emerging social and cultural identities that are formed at the intersection of multiple and multi-sited belongings. My paper was well-received and invited a number of questions from other panel members. My presentation was a contribution to the conference theme cluster, “The Cultural Politics of Survival,” in terms of the filmic representation of the Philippine city in contemporary urban cinema. The topic I presented is part of my ongoing research in Philippine urban cinema which I hope to develop further towards my PhD dissertation. There is a possibility for future publication in the refereed journal of the International Academic Forum. 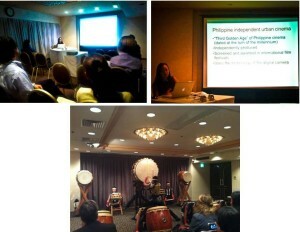 The conference was a great opportunity to meet other Asian cultural scholars, such as those from Hong Kong and Taiwan. The organizers also offered a discounted rate if I were to attend the next IAFOR conference. I am thankful that I was given the opportunity to present my current research on Philippine independent cinema at the Third Asian Cultural Studies Conference sponsored by the International Academic Forum. It was a great opportunity to interact and establish links with fellow researchers from around the world.